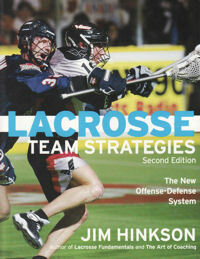 Since Lacrosse Team Strategies was first published in 1996, the popularity of the sport has surged. At the amateur level, the U.S. Lacrosse Association reports that playing at the youth level has doubled since 1999. Interest in the sport has spread from the east coast to the west, with professional teams now based in Colorado and California. This increased attention and participation has resulted in dramatic changes to coaching strategies for the sport. Always at the forefront of these developments, author Jim Hinkson brings them to fans, players and coaches alike in this concise, vigorous book. The book is simple enough for new coaches to grasp and challenging enough for experienced coaches to develop new ideas. Hinkson, a former lacrosse player and coach of both lacrosse and basketball for over 30 years, shows how team strategy relates to the play and systems philosophy. Numerous drills, accompanied by helpful illustrations, are provided to develop both offensive and defensive play, as well as man-short and power play situations. With more than just drills, the book helps coaches to develop their own personal coaching philosophy and apply it effectively in practice and strategy creation.